Over 600,000 reported accidents a year says industrial protective railing, particularly guard rail, has a place in manufacturing, distribution, and most industries. Guard rail keeps personnel safe, defines traffic areas, prevents random pedestrian traffic through work cells, protects rack systems, protects equipment, and is routinely used in creative ways within unique applications. 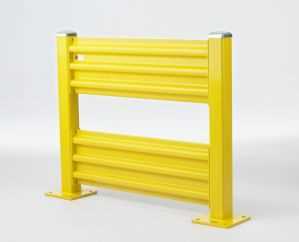 Guard rail is built to withstand the impact of an industrial truck. Guard rail is a protective railing system which is easy to implement and configure with its rails, posts, and our preconfigured starter and add-on units. CSI provides several versions of protective railing to keep personnel safe, define traffic areas, separate pedestrian traffic from work cells, protect equipment from industrial trucks, and many other unique applications. We also offer Wire Mesh Panels, Machine Guarding, additional rack safety items, handrail, and other safety & security equipment. Think safety! There is no topic which offers a higher return. To ignore safety could result in significant cost due to loss of life, significant injury, impaired morale, product loss, equipment loss, and loss of operations. The cost experienced from any of those individually would far exceed any investment into protective railing.